Fig 1.0 – The anatomical position of the radius. The radius is a long bone in the forearm. It lies laterally and parallel to ulna, the second of the forearm bones. 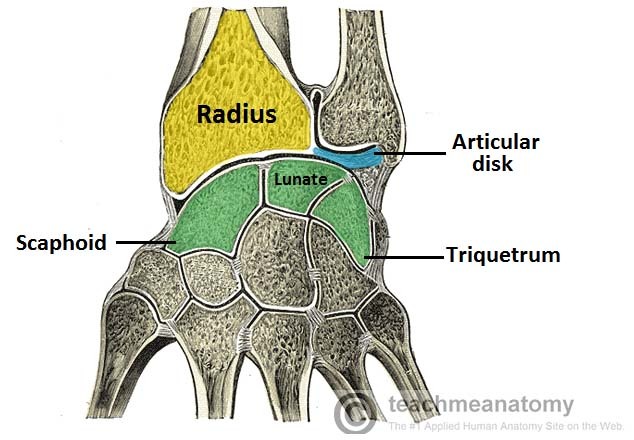 The radius pivots around the ulna to produce movement at the proximal and distal radio-ulnar joints. Elbow joint – Partly formed by an articulation between the head of the radius, and the capitulum of the humerus. Proximal radioulnar joint – An articulation between the radial head, and the radial notch of the ulna. Wrist joint – An articulation between the distal end of the radius and the carpal bones. Distal radioulnar joint – An articulation between the ulnar notch and the head of the ulna. 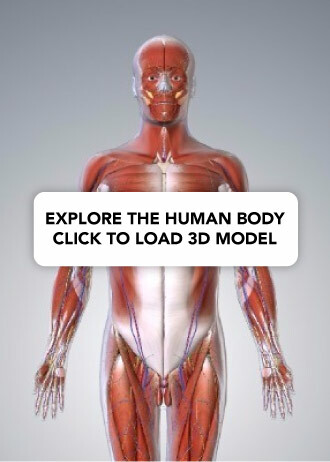 In this article, we shall look at the bony landmarks and osteological features of the radius. 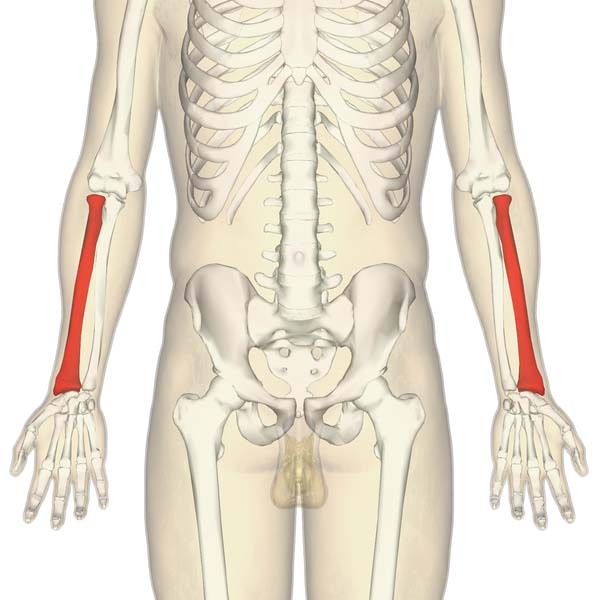 The proximal end of the radius articulates in both the elbow and proximal radioulnar joints. Head of radius – A disk shaped structure, with a concave articulating surface. It is thicker medially, where it takes part in the proximal radioulnar joint. Neck – A narrow area of bone, which lies between the radial head and radial tuberosity. 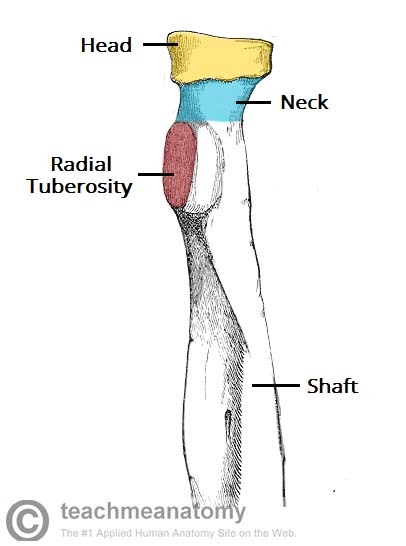 Radial tuberosity – A bony projection, which serves as the place of attachment of the biceps brachii muscle. Fig 1.1 – Bony landmarks of the proximal radius. In the distal region, the radial shaft expands to form a rectangular end. The lateral side projects distally as the styloid process. In the medial surface, there is a concavity, called the ulnar notch, which articulates with the head of ulna, forming the distal radioulnar joint. Fig 1.0 – Articular surfaces of the wrist joint. Colles’ Fracture – The most common type of radial fracture. A fall onto an outstretched hand causing a fracture of the distal radius. The structures distal to the fracture (wrist and hand) are displaced posteriorly. It produces what is known as the ‘dinner fork deformity’. Fractures of the radial head – This is characteristically due to falling on an outstretched hand. The radial head is forced into the capitulum of humerus, causing it to fracture. Smith’s Fracture – A fracture caused by falling onto the back of the hand. It is the opposite of a Colles’ fracture, as the distal fragment is now placed anteriorly. Fig 1.3 – Colles’ fracture of the wrist. Note the ‘dinner fork’ deformity, produced by the posterior displacement of the radius. The radius and the ulna are attached by the interosseous membrane. The force of a trauma to one bone can be transmitted to the other via this membrane. 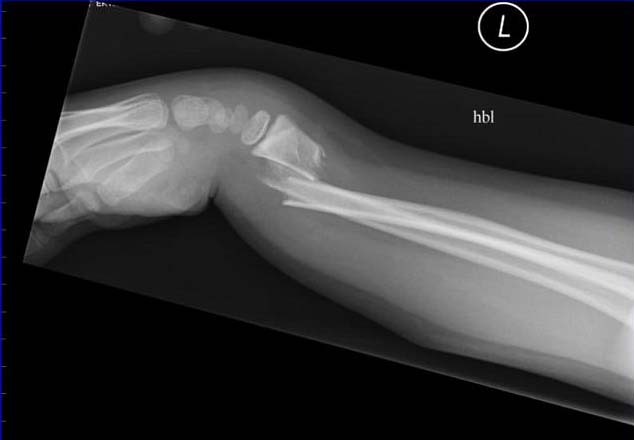 Thus, fractures of both the forearm bones are not uncommon. What type of fracture is demonstrated by the plain film radiograph shown? Which of the following bones does the radius not articulate with? Which of the following is NOT a landmark located on the proximal radius?